Visiting the new palace from the 18th century, also known because of its adjacent romantic park, visitors experience design perfection of Margravial culture. After the old palace burned down, the new town residence for margrave Friederich von Brandenburg-Bayreuth was begun by Joseph Saint-Pierre in 1753. Margravine Wilhelmine had considerable influence on its final form, designing some of the rooms herself, including the cabinet of fragmented mirrors and the old music room with its pastel portraits of singers, actors and dancers. The Palm room, with its outstanding walnut paneling is a typical example of the Rococo style in Bayreuth. On the first floor is the exhibition “Chivalrous miniatures – Dr. Löer Collection”. 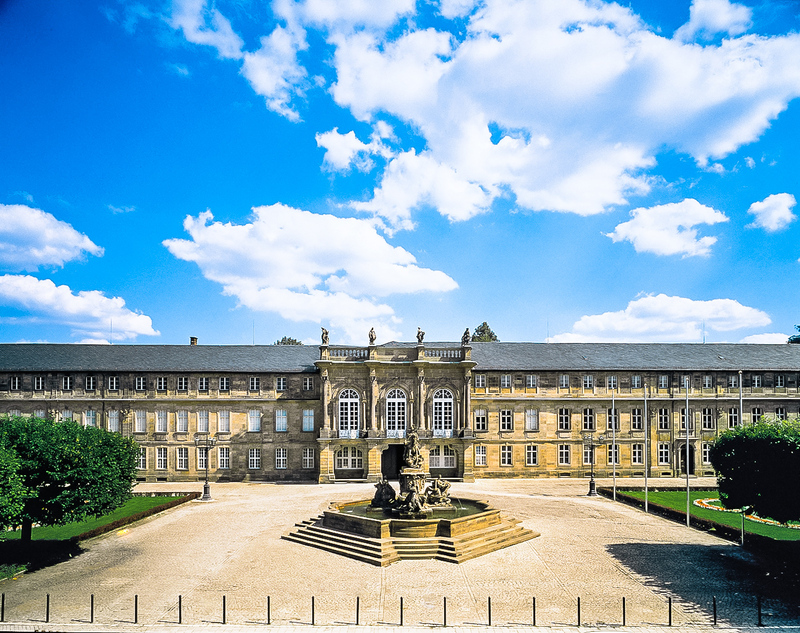 On the ground floor of the new palace, today the museums “Margravine Wilhelmine`s Bayreuth” and Bayreuth Faience – Rummel collection is seen with outstanding items of the Bayreuth manufacturer. The faience collection covers the whole period of production from its beginnings until 1788. The Gallery rooms (Branch of the Bavarian State Galleries), contain Dutch and German paintings from the 18th century. The rooms of the small but remarkable Italian Palace are an impressive example of the “Bayreuth Rococo” style in its later manifestations, with its typical features such as flower tendrils, trellis rooms and grottos. After the new palace was built, the garden, which had been margravial property since the end of the 16th century, was redesigned and extended: south of the pall mall alley, dating from 1679 which was included in the new garden, Friederich and Wilhelmine von Brandenburg-Bayreuth, added avenues, hedge gardens, pergolas and parterres. The central axis was a canal with a right angled bend and four islands. At the end of the 18th century, the court garden was transformed into an English style park with winding paths and natural placed trees. However the basic features of the geometric garden can still be seen: the park is dominated by the canal and the three main avenues and in 1990 the parterre, in front of the south wing was also reconstructed.